Style seers have never been terribly concerned with arbitrary boundaries, like the divide between “day” and “night” looks; “holiday” wear and “rest-of-the-year” wear — but even less so lately. 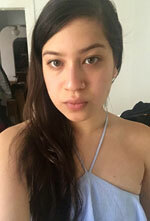 “I think because we are living in challenging times that designers felt quite rightly that what should be celebrated is clothes that made you smile or you wanted to have fun with that were really the antidote to what we might be seeing on our phones or our computers,” observed Vogue editor-in-chief Anna Wintour in the wake of the Spring 2018 collections. Hence the liberal sprinkling of sequins we saw on the recent runways. Just as they did during other admittedly rough times — the 20s, the 30s, the 70s — sequins are making a sparkly comeback. It’s now entirely acceptable to dress like a human disco ball on even the most ordinary of occasions. Heading to the grocery store? Slip on a sweater and shimmery midi skirt. Refract light. Demand attention. Temporarily distract those around you from the Sturm und Drang of life. Tom Ford set the stage for the glittery glam trend early, kicking off New York Fashion Week (and, in turn, fashion month) with a slew of Studio 54-ready evening looks. On an equally shimmery runway, Stuart Vevers showed sequined calf-length skirts with tough biker jackets at Coach. Michael Kors teamed tie-front work shirts with twinkling ombré trousers and, strangely, flip-flops. 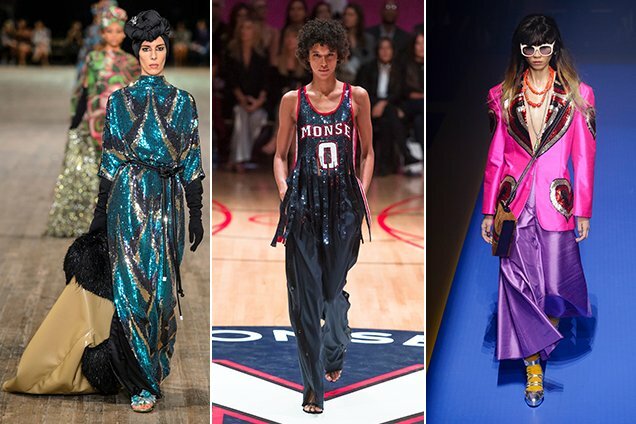 At both Monse and Oscar de la Renta, design duo Laura Kim and Fernando Garcia showed glittery, often logoed dresses, skirts and tanks — including one particularly covetable basketball jersey (the paper-shredder edges of which would later be seen on a trench at Céline). Many a Marc Jacobs girl walked in turban-to-toe sequins. Some gowns came styled with velvety waist belts and suede evening gloves, others accented by Carrie Bradshaw-esque floral brooches. Chez Valentino, Pierpaolo Piccioli combined glam and athleticism, mixing clear plastics with sequins, glittery tank tops with silky track pants. To the surprise of no one, the famously extra Alessandro Michele continued his Gucci glam parade with a slew of intensely busy — and fun — sequin-embellished lewks. (The heart-accented hot pink power blazer/lavender poodle skirt combo above was actually one of the more demure examples.) 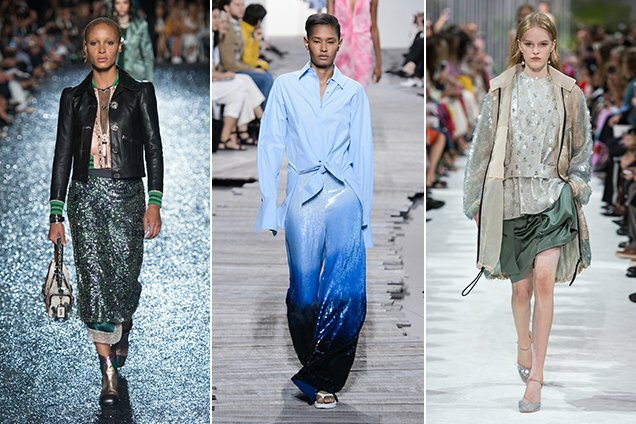 To list all the designers that got in on the glitter action would take all day, but here are just a few more: Molly Goddard, Simone Rocha, J.W. Anderson, Halpern, Christopher Kane, Dries Van Noten, Fendi. 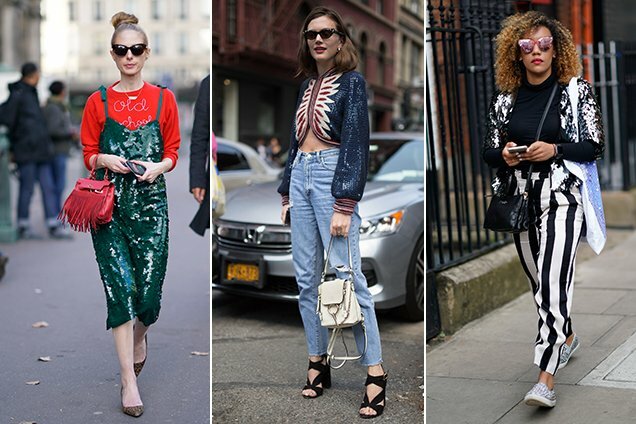 On the streets, showgoers offered up more “everyday” styling options. One layered her glittery pine maxi dress over a fire-engine red knit. Another teamed a cropped vintage Chanel jacket with high-rise mom jeans. A third used sequins as a neutral, offsetting bold vertical-striped pants with a plain black turtleneck and shimmering silver bolero. As with all 3D-effect materials, sequins beg for texture play. Style faceted skirts with cozy knits or statement tees, glittery dresses with sleek booties, shimmering turtlenecks with worn-in denim. If your sequin piece is patterned, the rest of your outfit should be neutral. But if it’s monochrome, feel free to play with pattern. We are living in the age of Alessandro Michele, after all. Don’t go (too) overboard. One glittery piece at a time. If you want to shine from head to toe, find yourself a bedazzled maxi dress. Ready to shine bright like a diamond? Treat yourself to something fabulous in the slideshow below.